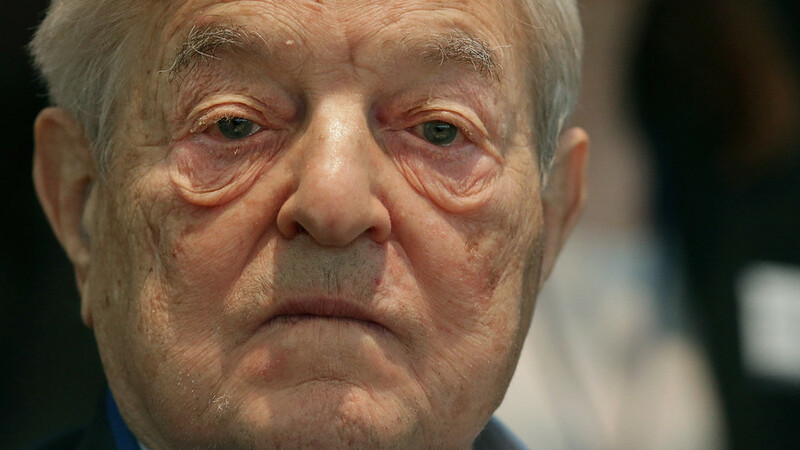 Save the evil one from the designation "terrorist"
A We the People petition to the White House calls on the United States to list multi-billionaire George Soros as a terrorist and to seize assets of his organizations and of organizations tied to him. The petition targeting George Soros was started on Aug. 20 by “E.B.,” and by Aug. 30 had more than 65,000 signatures. The petition requires 100,000 signatures by Sept. 19 to get a response from the White House. otherwise commit acts of sedition against the United States and its citizens,” and states he has applied a model of terrorist tactics similar to those proposed by Marxist radical Saul Alinsky. It calls on the U.S. Department of Justice to declare Soros, his organizations, and his staff members terrorists; and to seize their wealth and assets under the Civil Asset Forfeiture law. While it is fun to see Soros harassed, I object to anyone being labeled a "terrorist." If someone has committed a crime, they should be charged on the basis of the crime, provided it is a crime that would fit under NAP. otherwise, people should be left alone. Charging someone who has differing political views and is an activist is a very dangerous action. If it becomes a common practice, it could eventually be used against those who hold strong views in favor of liberty. Libertarians should, at a minimum be advocates of allowing all activities that do not violate NAP--whether we like the specific activities or not. Completely misses the point that Soros' actions are deliberately intended, and indirectly result in, numerous gross violations of the NAP. This "letter of the law" type analysis is not going to serve libertarianism, ever. Besides, if the state wants to use these tactics on libertarians (now or eventually) it will do so anyway. It doesn't need a "precedence" that involves Soros. If anything, the millions of violations and re-interpretations of the constitution have proven that. So stop pretending that it is *we* that are giving the state the means to combat us with. The terrorist designation of George Soros does fit. He finances people that initiate aggression against peaceful people. Libertarians don't do that. And if the state won't make that distinction here, it is because the state does not need to make it anywhere. Designating George Soros a terrorist is therefore a very good idea. ^ Translation of above: Others are criminals, so to effectively oppose criminality, we must become criminals too. This recursive logic is why liberty is so hard to achieve. So only a hit man is violating the NAP, not the guy who hires him? Yes, liberty is indeed hard to achieve when you think being some kind of holier than thou angel is going to get you anywhere. How has your LeFevrian tactic worked out for you so far? It's the type of violence you can use against those that use violence against you FIRST. It makes the violence morally acceptable. It is what blows the moral relativism that e.g. leftists like so much out of the water. Libertarians are not pacifists, nor are they stupid (at least, many aren't), so this constant pointless looking for the moral highground opposing scum like Soros is not ever going to get you anywhere. Or maybe you are seeing a trend that i am unaware of? Have any leftists embraced you yet for not regarding Soros a legitimate threat to liberty, and a sponsor of actual violations of the NAP? As Paul Hansen points out, we are not talking about a man who merely posits a personal opinion, but about a man who financially supports violent thugs and criminals, as well as organizations that want to enslave you even more than is already the case. So no, we are not becoming "criminal" by designating Soros a terrorist. Not by the current statist understanding of the word, nor the libertarian understanding. So if you want to talk about "logic" may i suggest you first get a handle on the proper meaning and application of common words? Until then, congratulations on your self-designated moral superiority. Not at all...but one does require evidence and petitions are not evidence. Which evidence would that be? Evidence collected by state agencies, to be submitted to state courts, where state judges are to reach conclusions? Wake me up when the state is about objective and real justice when it comes to powerful puppetteers like Soros funding the kind of NAP violations that the state itself deems completely ordinary. For furthere reference on the reliability of state agencies pursuing truth and justice: see FBI / Hillary Clinton. No, i don't rely on the state to tell me the guilt or innocence of someone that supports and funds NAP-violating institutions. I'm not in the habit of putting final moral judgment in the hands of the very institution that rigs the game in the first place. Just because a course of action can be justified as self defense that does not imply that it is a sound strategy. “George Soros has willfully and on an ongoing basis attempted to destabilize and otherwise commit acts of sedition against the United States and its citizens,” and ... that the programs funded by Soros have worked to “facilitate the collapse of the systems and Constitutional government of the United States ..."
[Gulp] Doesn't this all describe all anarcho-capitalist / PPS-oriented advocacy, educational and discussion groups? Yes, we don't advocate initiating violence, but we are trying to lay the intellectual foundations for, and articulate the benefits of, a stateless society. Well said, NAPster. In a related issue, I really resent people calling ANTIFA "anarchists". As a proud anarcho-capitalist, I take umbrage. I think it would be better comparison if anarcho-capitalists/PPS-oriented people were busing in 'protesters' and encouraging violence. But since it is an intellectual battle it is essentially opposite of what Soros does since he uses the 'useful idiots' to accomplish his goals. While I dislike to idea of any American group being labeled a terrorist (which upon receiving that designation you have absolutely no rights whatsoever), I think someone with the track record of Soros likely deserves that title. Even his home country of Hungary has turned on him. Since he is 87, they may want to focus on his evil little children as well. I'll take my chances with Soros's goons over Trump and the state any day. So, deindividualist, you want the State, who you are rightfully denouncing, to declare him a terrorist? Why would a Libertarian want the State to do anything for him except leave him alone? The State is the Enemy. And in this instance, the phrase," the enemy of my enemy is my friend" doesn't work.